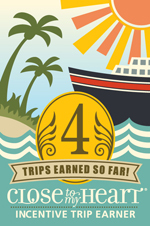 Be sure to get your Triple Play in time for my workshop. 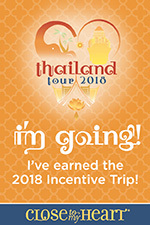 See my website for details. Here is my card gift set! Oh and if you didn't get to join in on the Creative University Online yesterday, you can click on CU Online button to the right and see recorded versions of the classes. They had some great ideas. Check them out when you are looking for some inspiration! Stay tuned this week, I'll be posting some new September Stamp of the Month Artwork that will be a 'Thriller!" 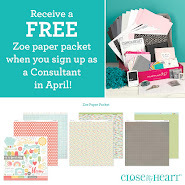 Where can you get NINE hours of free classes, presented by some very talented Close to My Heart consultants? At Creative University ON-LINE on Saturday, August 28th! They will be kicking off the new Autumn/Winter Idea Book and Catalog. 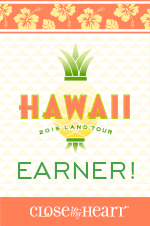 One of my favorite and VERY TALENTED Close To My Heart Consultants, Tresa Black, has assembled a top-notch team of co-hosts for this event, with a variety of demonstrations to showcase new products from Close to My Heart. Just click on the CU-Online button to the right and it will take you right to the University! Don't worry - if you miss some of the episodes you will be able to view the recorded versions later! I remember the first time I saw peacock spread it's iridescent tail. I was in awe of the color. The blues and greens were rich and luxurious. Now, Close To My Heart has captured these colors in their newest paper pack, Magnifique, that reflect the glorious peacock. These colors just happen to be some of the newest colors being introduced into our Summer color palette - Lagoon, Pacifica and Sky. My first workshop using paper from of the new book is Magnifique! The color of Chocolate mingles in with blue and green hues of the paper bringing a richness to your layouts and cards. The revised instruction brochure now shows step by step pictures making it even easier to follow. The card instructions have been improved too showing steps for each card design - also with pictures! Below is the feature layout from the Workshop that we will be doing in September. The kit comes with the Mini-Medley Accents Shades of Chocolate collection. For an extra touch, I added the new Opaques Pearls to my layouts placing them in the center of some of my stamped flowers. I LOVED the coordinating Magnifique stickease. The layout below is from the new Magic book. The book comes complete with a DVD which has video instructions for some of the techniques and also templates. These were just perfect for pictures my mom took when she and Kayli went to eat at Steak & Shake. Kayli was being "Kayli" so the sayings were PERFECT! I have plenty of paper and stickease left to make more layouts or maybe even more cards! If you would like to do this workshop, check out my September calendar for more information! I still have room! September 30, 6:00 pm. The new Autumn/Winter Idea will be available September 1 on my website. You can browse page by page to see all the new products. Rather have one in your hands??? 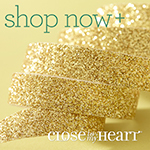 Just click the Pay Now button to the left and I'll mail one to you this week along with a $5 gift certificate to use with your next Close To My Heart purchase with me! I have found that it is a good thing to keep a few My Creations projects on hand. When a special occasion creeps up on me, I love being able to throw something together fairly quick. When my daughter told me she needed to get her friend something for her birthday I was ready. I just happened to have an extra All Sorts Mini-Album and some Topstitch paper and stickease. The My Reflections Topstitch was one of my favorite papers that came out in the Spring 2010 Idea Book. 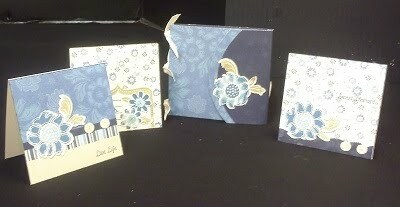 I had already created 2 layouts with this paper pack and even a couple of cards. I had enough paper left to make this mini-album. I used the coordinating stickease and added a little bit of stamping and embellishments. I LOVE the Ms. Chillin' stamp set I used on pages 5 and 6. For the girls, I stamped them on Colonial White cardstock, and also on B&T papers. I cut out the pieces of the B&T papers and glued them to my stamped image on the Colonial White cardstock. For the denim jeans - I used Outdoor Denim CS and sanded it before stamping on the image. I used watercolor pencils and a blending pen on the hair, popcorn, shoes and brush. The Ms. Chillin' Stamp set is perfect for teenage girls and has words/phrases such as 'LOL', 'TEXT ME', 'Hangin Out', 'seriously' and more! If you have girls - this is a MUST HAVE stamp set. See the complete Recipe for this album below. NOTE! 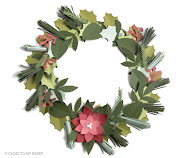 The Topstitch paper & stickease and the Soft Suede Pinwheels will be retiring December 31! Be sure to order yours if you don't want to miss out on this cute paper! I have 3 sisters. Although I live only minutes from one and many miles from the other two sisters, we will always be close. Today, August 22, is my sister's birthday. I started to say my 'oldest' sister, but there comes a day that 'oldest' just doesn't seem to be the appropriate description to use. My sister, Kathie, was the first of four girls for my mom and dad. FIRST has a lot of meaning in Kathie's case and also in the case of my mom and dad. First daughter, First to potty train, First to send to school, First teenage driver, First to wed.... the list goes on. Being the FIRST, Kathie unknowingly set a precedent for many things in our family. This at times could be a heavy load to carry. (BTW I'm #3 in the line of sisters). So big THANKS to Kathie for 'paving the way' for the rest of us. Kathie is one of my long distance sisters. I look forward to the time that we can spend together. Both of us have daughters who are the same age - They were our First. Mine was born in February and hers followed in April. So Kathie and I had many discussions over the years (and still do) about what our daughters are going through or what WE are going through with them! So, to my wonderful sister of FIRSTS - Happy Birthday! I made this special card for her! About the card: I used the Veranda Creative Basics Collection. The Creative Basics Collection comes with 12 sheets of B &T paper ( 6each of 2 designs) and a coordinating round of ribbon (4 yards). These collections are designed for card makers that love to make multiple cards! NOTE: Keep a supply of cards and envelopes on hand with our Value Pack! To adorn my card, I used a few flowers from the Just Blooms Paper Flowers and layered for an added effect. I cut the daisy in half and used 1/2 of a small paper flower inked in Garden Green ink at the stem. I stamped the flower stems using Garden Green Ink. I used Antiqued Copper brads for the flower center and added a triangle photo corner in the upper left corner. And for that final POP of color I used a Tulip Butterfly (from Paper Flowers Collection) and stamped "Happy Birthday" in Tulip ink. Congratulations for being In the Spotlight this month! 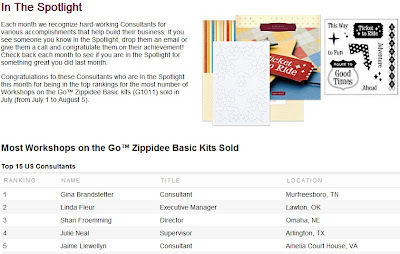 We are recognizing you because you were one of the top Consultants who sold the most number of Workshops on the Go™ Zippidee Basic kits (G1011) in July (from July 1 to August 5). Great work! 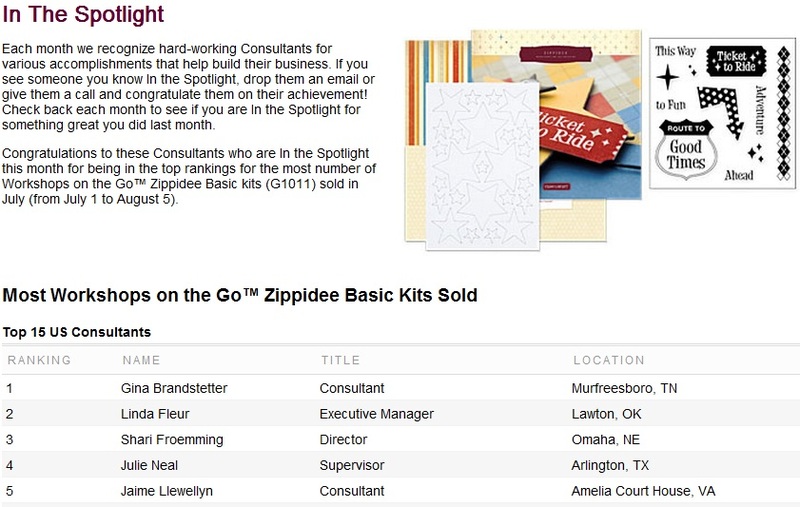 We appreciate your hard work in selling these kits to your customers and club members. Watch for your name and achievement to appear on Close To My Heart's Online Office page under To Know > Recognitions so all Consultants can applaud your success. Well done! So, I went to check out the Recognitions and this is what I found! Check out the NUMBER 1 spot! I thought "oh wow!" I almost fell out of my chair! Zippidee was a big hit with my customers but how could people NOT buy it! It is FUN! Not only was it GREAT for Disney or any theme park pictures, it is wonderful for any summer event! If you didn't get this kit (comes with everything you see above including a Level 2 Zippidee Paper Pack) you still can! But hurry! This kit is ONLY Available until September 30. You can purchase the Zippidee Level 2 or Level 1 paper and the Level 2 Stickease until December 31st. 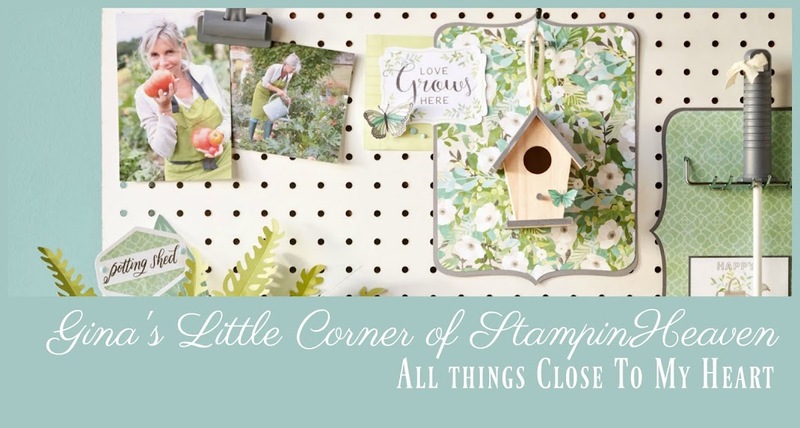 Sunday, August 15th is the beginning of Close To My Hearts promotion for National Stamping Month. They always come up with the most awesome kits! This one is no exception! It is a set of THREE 4x4 mini-album that comes with everything you need to put them together including die-cuts, ribbon, instructions, 4 colors of mini ink pads and a stampset! Each mini-album is a different color scheme - Sorbet, Hollyhock and Indian Corn Blue. I put one of these together this evening in just 2 hours. This little album has so many momento opportunities... birthday, a favorite trip, a family reunion or get together, the list goes on. Make one for your favorite teacher, grandparents, friends... the ideas are just endless. 3) Purchase $40 in My Acrylix stamps and get it for just $5! PLUS I'm offering a Triple Play workshop in October for anyone that gets this kit. 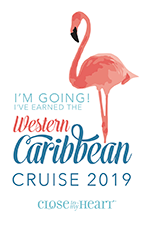 Check out my website for all the details. This was a little keepsake album for my daughter of her 8th grade trip to Washington, DC. Here are just a few pages from the mini album. I used the sorbet color. These are the pages from the middle opened up. No, I'm not talking about a social Mix & Mingle! I'm talking about Close to My Heart's newest My Creations album. It's the Mix & Mingle album (Item #Z1334). 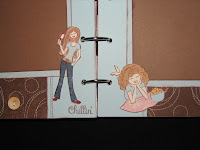 This cute little album includes 3 clear and 5 white chipboard pages in 4 die-cut shapes. It includes jump rings that you can easily remove and re-arrange. When I was looking at the artwork in the new Autumn/Winter Idea Book (available in September) a really adorable wall hanging caught my eye and I just knew I had to make one! I made a similar wall hanging for my daughter's room in just a little under 2 hours! I used paper from the soon to be released Hooligans Level 2 paper pack (X7129B). The blue and pink papers are from scraps of now retired paper kits. This why I never throw any scraps away! 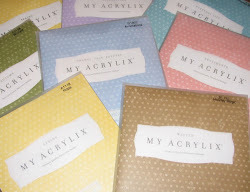 Our papers can be mixed and matched so easy among the different paper packs! To embellish the wall hanging I used pieces of dimensional elements from Fresh Shapes (Z1019) and Simple Alphabet (lower) (Z1048). The flower DEs were from some older sets that are now retired. I used the Create-A-Shade Pearl Paint to give the white DE's a shimmery shine. I inked the black DE's in Black ink. I also used the new Pearl Opaques (Z1336) coming in September for added shimmery embellishment! The new Autumn/Winter Idea is so exciting! You will be able to see it On-Line on September 1st but there is nothing like having one in your hands! If you want your very own copy, just click on the paypal link to the left! FINALLY! I just loved the Animal Cookies paper when it came out last summer. I ordered a Level 1 kit to show at my gatherings knowing that eventually I'd use it for something. CTMH introduced the My Creations Board Book (#Z1310 - $6.95) in their 2010 Spring Idea Book. I thought this would be a GREAT project to do using the Animal Cookies Level 1 kit. Using Level 1 kits for projects such as this are great. You have everything you need to create a book! Just add some additional embellishments to bling it up and VOILA' ! it was so easy! First, I cut 3 of the pre-printed pieces into 6x6 squares. 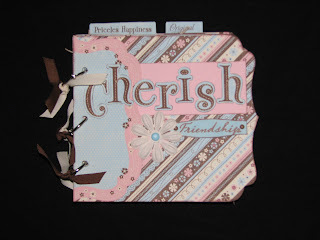 Then I added mats from the extra cardstock and B&T papers and used the stickease to create a title. I used the rest of the stickease to embellish the other pages. I also used 2 of the My Creations A-door-ables (#1321 - $3.95) that were also introduced back in the Spring. Buttons, zig-zag ribbons and brads add just the right touch to make this an adorable inexpensive gift for a friend - made from my heart! WHO DOESN'T LOVE A GREAT SALE??? Especially when it's paper!! I love paper! I've loved paper since I was a kid. When my mom thought it was time to re-do a room (which seemed quite often) I would go to the Wallpaper store with her. There were shelves and shelves full of books. I could sit for hours just flipping through the pages of those great big books of wallpaper. You could change the whole look of a room with paper and I'd imagine the rooms I'd decorate with the different papers in those books. Country, Exotic, Pastels, Bold & Bright, Masculine, Sophisticated...... all different. I still have a fascination with paper - only now, it comes in plastic zip lock bag which is easier to carry than those huge books! Just like those wall paper books, our Idea Books are filled with a paper for every occasion! So what is this big sale??? It is a HUGE customer appreciation sale! And it includes some of our newest papers! If you have had some favorites on your wish list, or just starting out, now is the time to get them! This sale begins Wednesday, August 4th at 10am and will last for ONLY 8 days. After August 11th, everything returns to normal pricing. These are web only orders. Just go to my website on August 4th and start shopping! Click on the shopping link to the left of this post and select the $2, $4, $6 and 8 sale link! Not familiar with our paper packs? Here is a short description of each type: Level 1 and Level 2. Level 2 - Especially Creative: Add your individual flair to every project by building designs from this kit. Make each layout unique with beautiful Background and Texture (B&T) papers. They have versatile front and back designs and colors. 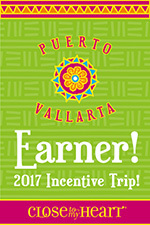 (includes 12 sheets of B&T - 2 each of 6 designs; and 10 sheets of coordinating cardstock - 2 each of 3 colors and 4 of one neutral color) You can get up to 6-8 layouts with just one Level 2 paper pack! And still have enough left to make a few cards! Level 2 Stickease - Add to your Level 2 kits with the coordinating My Stickease. You'll have beautiful pages in a snap! Complete your order with one of Jeanette Lynton's How To Books: Reflections (9031); Cherish (9029) or Imagine (9030). These books provide over 50 layouts with step by step cutting instructions and layout designs and they include tips and techniques with each layout! If you like to make cards, you'll love Jeanette's How to Books for cards - Originals (9032) or Wishes (9033) These books are $21.95 each!